What a week! I am so thankful to have had the opportunity to go to the Marian Eucharistic Conference in Greenville for the third time. This time, both kids had commitments so Michael and I went by ourselves. I fretted over leaving them, esp. Dagny, but the minute we headed out, we prayed the rosary and all my worries dissipated. 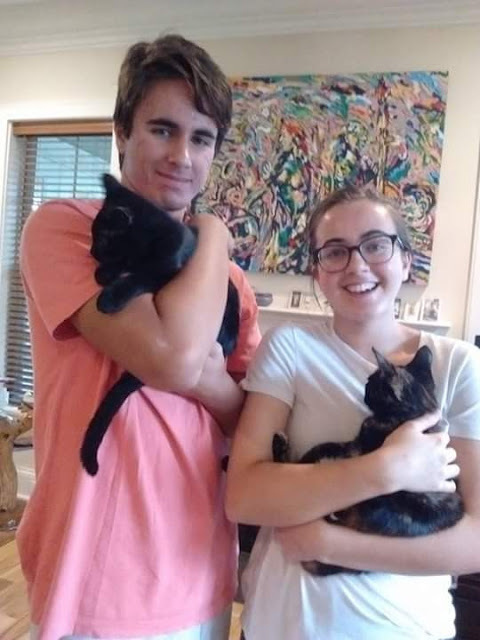 Dagny did terrific job taking care of the household chores and pets; Max had football and work, but after work they went out to dinner and a movie. It is a great grace to have responsible children. We went to Bob Jones University first to enjoy their amazing collection of Catholic art. They have so many altar-pieces and paintings they collected as America and Europe were discarding these for a plainer look. I’m not sure why people would choose to dismantle such beautiful things because the great beauty of the churches points to heavenly things. But that’s a topic for another day. If you are ever in Greenville, SC, take the time to visit the museum at Bob Jones Univ. I could spend days there. I am thankful they have preserved all this art. 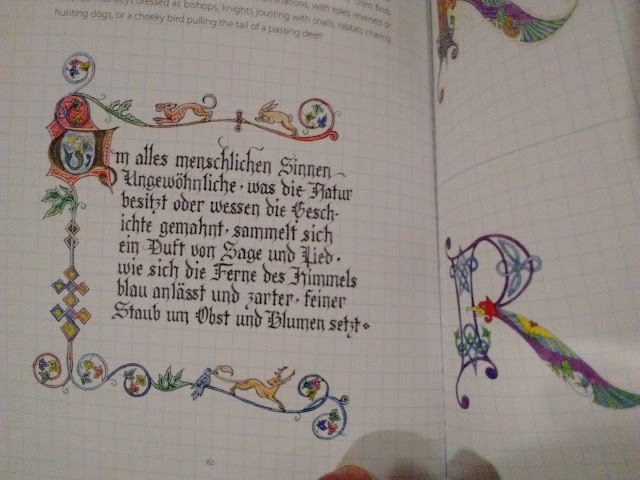 I would’ve enjoyed having a book with all their art, instead I splurged on a little calligraphy book. 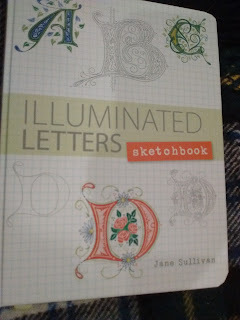 My friend Colleen did beautiful calligraphy and taught me the basics but how I long to do much more. 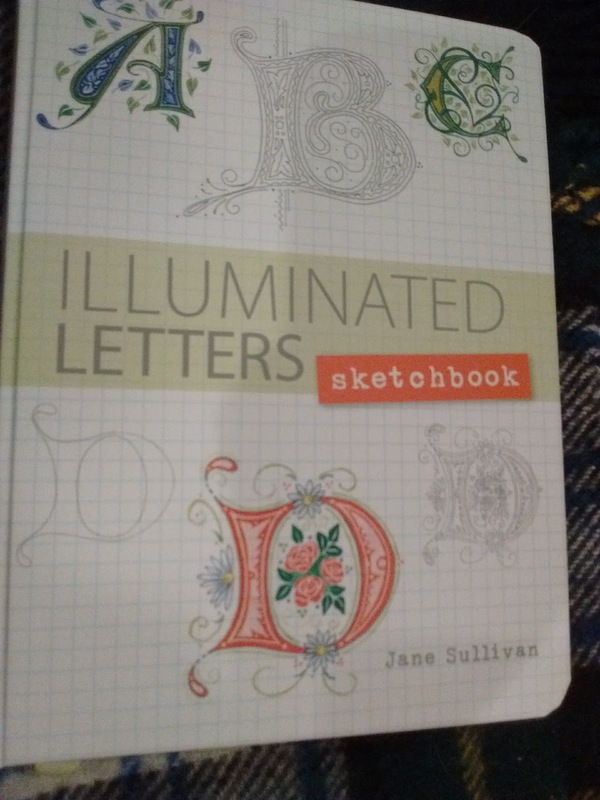 I am grateful to have a bit of my calligraphy published in a book (I can’t say any more, so don’t ask … it’s hard keeping secrets). He exhorted us to not wring our hands and say, “There is nothing we can do.” We can pray, go to Mass, Adoration. We can sacrifice. Catholics, 68 million of them, can make a difference if we live our faith. He said, “If this conference brings only person closer to Christ, it is of infinite value.” And so I say, if sharing my notes brings one only person closer to Christ, it is of infinite value. Thank you for reading. Prayer of St. Faustina. Jesus, I trust in You. He told her: Those who venerate the image will not perish. You will prepare the world for My second coming. I will come first with mercy before I come as a judge. Souls have time for everything except Me. If they run away from my merciful heart, they will see my justice. AD 2017 is a significant year for the Church and the world. Oct. 2017 will be the 100th anniversary of the final apparition at Fatima, the 100th anniversary of Red October, and the 500th anniversary of the Protestant schism. 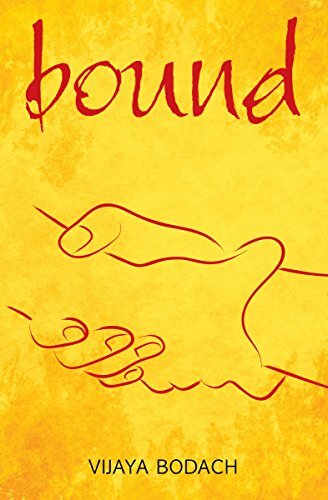 There is no such thing as coincidence when it comes to Divine Providence. Pope Leo XIII had a vision at Mass where the devil asked for a 100 years to destroy the Church. God gave him free reign. Reminds me of the Book of Job. 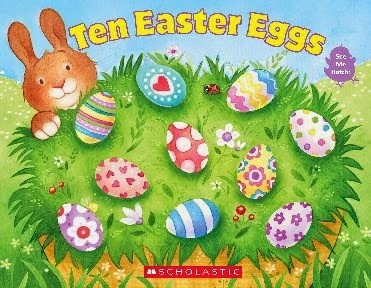 So when did these 100 years begin? Nobody knows. But some people think it might be Oct. 1917. Regardless, the devil is raging. The whirlwind is here. We must keep our souls in a state of grace. God’s mercy is our only hope. And we have Christ’s promise that not even the gates of hell will prevail against the Church. Christians are once again the most persecuted minority in the world. It is an age of apostasy. You must choose between the Church and the anti-Church; the Gospel and the anti-Gospel. Eschatology is the study of the end times. People mistakenly believe that the Church will rise. But the Catechism says the Church will suffer. So enter through the door of mercy otherwise pass through the one for judgement. Be in God’s grace. We don’t know the hour of our death. There is no contradiction between God’s mercy and His justice. God’s love is unconditional. But God’s mercy is conditional – it requires our repentance. We must cooperate with Him. St. Faustina knew a nun who suffered from scrupulosity. Jesus told her: Tell her that her lack of trust wounds My Heart far more than her sins. The source of our peace is assurance that God’s love is real. Get over your sin. Your sin isn’t bigger than God’s mercy. 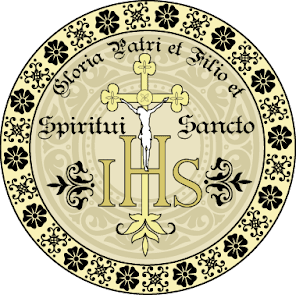 However, if you die in a state of mortal sin, unrepentant, you will go to hell. Padre Pio said, "you'll believe in hell when you get there." That’s not God’s will for anybody. The remedy is confession. This sacrament renews you. Christ works in your soul. God did not have to create us, redeem us. It’s totally gratuitous, merciful. God could’ve cast us off, left us to our sins. But His Love would not allow it. God came to earth. He could’ve redeemed us in any way possible, with a snap of His fingers, a drop of His Precious Blood. But Jesus redeems us through obedience and suffering. Why the Cross? Why the Blood? Because suffering -- passion -- is the ultimate test of true love. And He is with us even now in the Holy Eucharist. Go to confession. Pray. 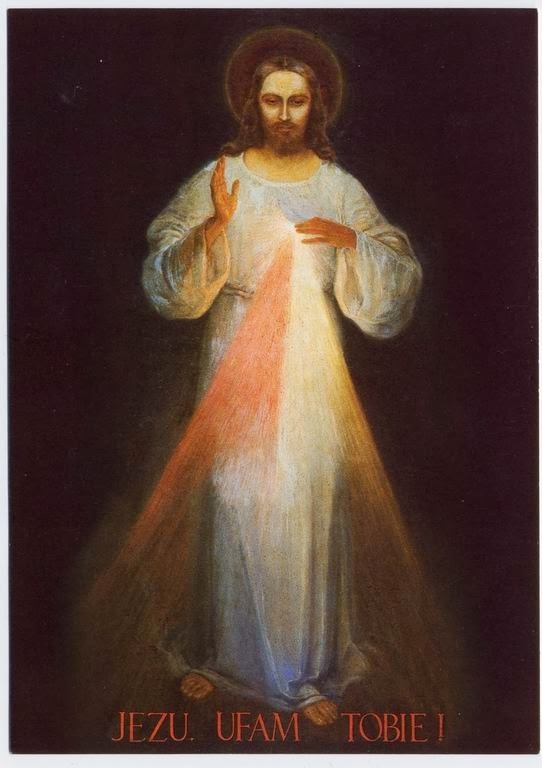 Meditate upon the Face of Divine Mercy. 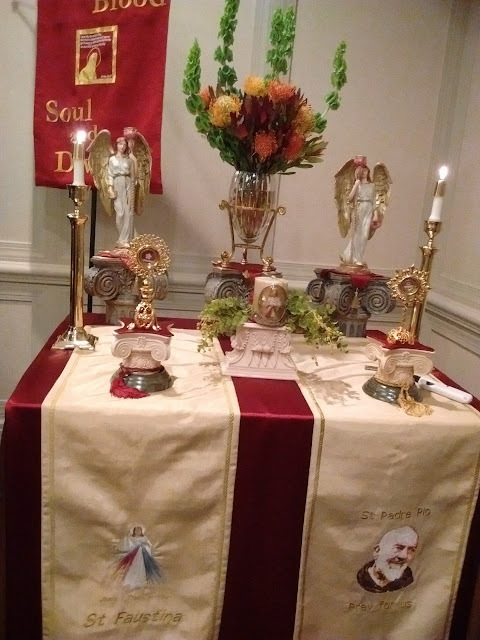 We had the opportunity to venerate the relics of St. Faustina and St. Padre Pio. Print out the black-and-white picture. Stare a the four vertical dots for about a minute (they said 30 seconds is enough but it took me four tries and 3 Hail Marys to get it). Then close your eyes while turning your face towards a light source. Do you see something amazing? Let me know. "...Do you want the plain one or one with the little man"-- Can't imagine this in NYC. Really. 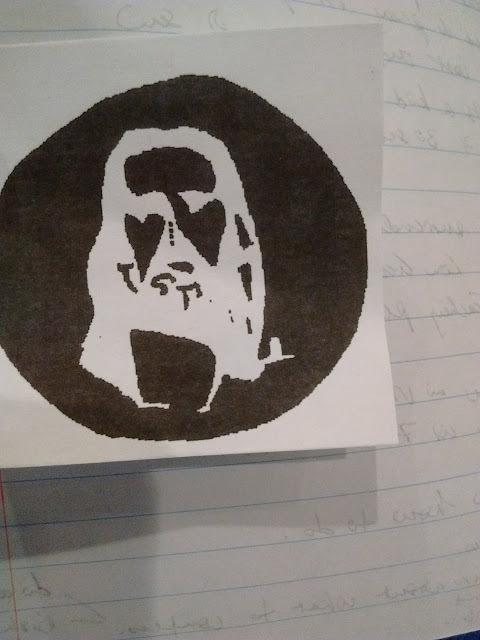 I see Jesus in the black and white pic. Took me about 15 seconds of staring at it. Mirka, unbelievable but true. And yes, the kids did great. Suman, you got it. Pretty amazing!